Round 21 featured several upsets, but the league's top teams have begun to separate themselves from the field. In recent Turkish Airlines EuroLeague history, regular season offensive and defensive efficiency has been a strong predictor of postseason success. Through 21 rounds, several teams have stood out, not just offensively, but defensively as well, causing several potential favorites to emerge with the postseason push right around the corner. The table above features the top teams in the EuroLeague this season in points scored per possession. Fenerbahce Beko Instabul remains the class of the league as they have for much of the season. Their 1.10 points scored per possession is still on pace to break the modern league record. One of the top shot-making teams in European basketball history from the perimeter and the paint, Fenerbahce has scored 1.11 points per pull-up jump shot this season—a more efficient rate than half of all EuroLeague teams have scored on notoriously more efficient catch-and-shoot jump shots. There is no shortage of remarkable situational numbers and superlatives to throw around when describing the way Fenerbahce has played this season, but that did not stop FC Bayern Munich from beating last year's runners-up and the 2017 champions in Round 21. Anadolu Efes Instabul has risen steadily over the course of the season to rank as the EuroLeague's second-best offensive team. 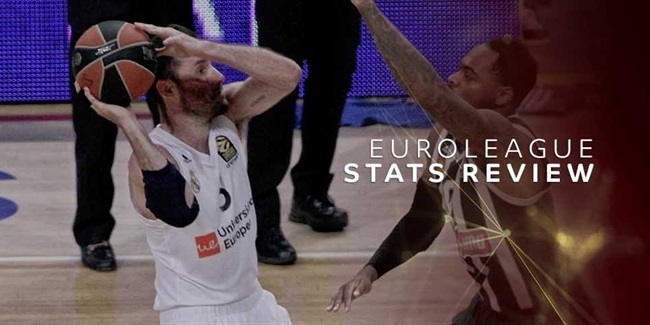 The top pick-and-roll offense in EuroLeague history, Efes has embraced ball-screen trends to great effect this season. Considering that Efes finished 16th in offensive efficiency a year ago, the way it has reinvented its offense to almost league-record efficiency levels is one of the season's most interesting developments. In a sign of the times, Real Madrid's 1.06 points per possession scored this season sits well ahead of the 1.03 that the team scored while winning the EuroLeague trophy with Luka Doncic in the lineup a year ago. 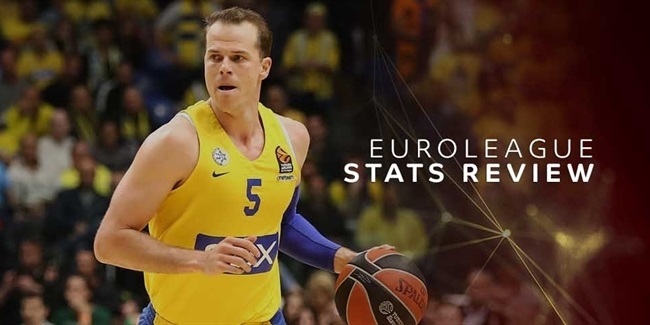 There's little doubt that as the league's premier offense continue to push the boundaries of offensive efficiency, their competition will begin to catch up as the EuroLeague's offensive renaissance continues. CSKA Moscow has been a model of consistency over the last few years. Though they rank fourth in the EuroLeague in scoring efficiency, this season is only the club's third-most efficient campaign since 2016. With six of its nine remaining games at home, it will be interesting to see if CSKA can make a push towards the top of this list later in the season. AX Armani Exchange Olimpia Milano remains the fastest starting team in the EuroLeague, and the addition of James Nunnally, who ranked among the league's five most efficient scorers a year ago certainly will not hurt in that regard. FC Bayern Munich scored only 0.93 points per possession in the 2015-16 season, the club's last one in the EuroLeague until now. The Germans have set a far higher standard this season, finding themselves firmly in the playoff picture after their impressive victory over Fenerbahce. There is a signficant drop-off in terms of efficiency after Bayern, showing that this club has solidified its standing among the league's best. The table above features the top teams in the EuroLeague this season in points per possession allowed. Real Madrid may be just off its offensive standard from a season ago, but defense of the defending champions has gone from very good to great. Allowing 0.96 points per possession last season, Madrid's perimeter defense has improved significantly in half-court situations, setting it apart from the rest of the league to this point. In contrast, FC Barcelona Lassa has sustained a defensive performance of 0.96 points per possession that the team allowed a season ago. In an era where offensive efficiency continues to grow, Barcelona's continued excellence has pushed them up the defensive rankings. Few teams have been as balanced as Barcelona has on that end of the floor this season. Panathinaikos OPAP Athens has performed at a similar level defensively all year. Following their coaching change, the Greens have defended the three-point line more effectively, but have forced fewer turnovers, thereby weathering the transition without a setback in their overall defensive performance. As well as Fenerbahce has played offensively, the league leaders have more than held their own defensively as well. They currently hold the EuroLeague's highest per-possession efficiency differential (0.127), which is the difference between points per possession for and against. And while much of that stems from Fenerbahce's record-pace offensive efficiency, their defense has been key to the slight edge they hold over Real Madrid statistically (0.125) and in the standings. Neither CSKA nor Efes have been overwhelmingly effective in any one area defensively, but their placement stands out considering their offensive efficiency. After Madrid and Fenerbahce, CSKA and Efes have the other two efficiency differentials significantly above even. It is no coincidence that the four teams with the highest efficiency differentials are the top four teams in the standings. However, it is notable that Efes has gained ground on Madrid and Fenerbahce since the early part of the season, but still sits fourth behind CSKA in the standings. It will be interesting to see if Efes's performance on paper begins to show through in the win column over the next two months. Synergy Sports Technology breaks down the strengths of the seven teams in the hunt for the three undecided playoff berths with two rounds remaining in the regular season.